Located throughout Ireland, Celtic High Crosses are a form of religious Irish sculpture unrivalled in Western European culture during the Middle Ages. Indeed, according to some experts, these Irish crosses constitute the most significant body of free-standing sculpture produced between the collapse of the Roman Empire (c.450) and the beginning of Renaissance art in Italy (c.1400). In conjunction with Celtic metalwork art and the outstanding illuminated manuscripts, Celtic High Cross sculpture represents Ireland's third major contribution to the History of Art in general, and to the history of Irish art in particular. High Cross of Kells, Co Meath. These High Crosses were constructed on religious sites, often as part of a monastery complex - making them very much a part of monastic Irish art. Fixing a precise date for each cross is difficult, not least because some were preceded by wooden or metal crosses which were not differentiated in contemporary descriptions. The consensus among archeologists is that construction spanned the period (c.750-1150), with most High Crosses being errected in the ninth and tenth centuries. Among the earliest examples of this form of early medieval art are those in Co Tipperary, and the group at Kilkieran, Kilree and Killamery in County Kilkenny. Other groups include those from North Leinster (eg. Duleek, Kells and Monasterboice) and the Midlands (eg. Clonmacnois and Durrow). Celtic High Crosses fall into two basic groups, according to the type of carving they display. The first group includes those crosses decorated with abstract patterns from Iron Age Celtic culture; the second, includes crosses with narrative scenes from the bible or the lives of saints. A few, like the high cross at Castledermot, display both types. Debate continues as to whether these scenes were painted. If they were painted, the medieval artists involved would probably have used similar colours to those found on metalwork of the same period, such as dark reds, greens, blues and yellows. The function of these high cross sculptures no doubt varied from site to site. Some were errected to commemorate a particular event (eg. the building of a church, the actions of a Saint), or more general penitential purposes. Others may have simply marked a diocesian geographical reference point concerning land or religious jurisdiction. In any event, they comprise an important body of early Christian art, with strong associations with earlier traditions of abstract Celtic designs. Irrespective of their precise provenance, date or function, these Celtic High Crosses were some of the most outstanding scriptural sculptures of the Middle Ages, and clearly demonstrate a high point in European as well as Irish sculpture. In terms of Celtic art, they are a worthy successor to the stone sculpture produced by Celtic artists before the arrival of Christianity, of which the best surviving example is the Turoe Stone. Surviving examples of this outstanding form of medieval religious art include the following. In County Clare: Kilfenora. In County Fermanagh: Boho, Lisnaskea. In County Kildare: Castledermot, Moone, Old Kilcullen. In County Kilkenny: Graiguenamanagh, Kilkieran, Killamery, Kilree, Ullard. In County Louth: Dromiskin, Monasterboice, Termonfeckin. In County Meath: Kells. In County Monaghan: Clones. In County Offaly: Clonmacnois, Durrow, Kinnitty. In County Sligo: Drumcliffe. In County Tipperary: Ahenny. In County Tyrone: Ardboe, Donaghmore. In County Westmeath: Bealin/Twyford Demesne. The Kilfenora site, located in the Burren, County Clare, was originally occupied by a monastery founded by St Fachtna. It is now occupied by the Cathedral, which was constructed during the late twelfth century. There are six high crosses at Kilfenora (one being removed to Killaloe during the early nineteenth century), of which three are still whole, including the famous carved Doorty Cross. Another sculpture, known as the West Cross, stands some distance away. The Doorty Cross displays a number of weather beaten religious and scriptural carvings, while the West Cross contains a crucifixion and various Celtic patterns. Located in the graveyard of the Sacred Heart Church in Toneel, the Boho High Cross of County Fermanagh was built from sandstone and is about 8 feet tall. Its scriptural carvings include scenes from Genesis and the Baptism of Christ. Archeological evidence indicates that the sculpture was re-erected in the graveyard sometime during the mid-nineteenth century. Standing in the potato market on the main street of the town, the high cross at Lisnaskea, County Fermanagh, is a composite sculpture with an original base (relocated from a local monastery), about 5 feet tall, topped by a more modern cross. Scriptural illustrations are similar in content to the Boho Cross, depicting Adam and Eve in the Garden of Creation. The two surviving ninth century granite high crosses at Castledermot, County Kildare, stand on the site of an abbey founded by St Dermot. The monastic complex still boasts a Round Tower, and the remains of a third cross. The two complete sculptures depict numerous biblical scenes, including: the Crucifixion and the twelve apostles from the New Testament, and the Garden of the Creation, King David, the Sacrifice of Isaac and the prophet Daniel. At 5.5 metres in height, the High Cross at Moone, in County Kildare is the second highest cross in Ireland. Now restored to include all its original parts, the eighth century granite cross now stands inside the ruins of the medieval church, which was part of one of the earliest Irish monasteries founded by St Palladius during the fifth century. Scriptural illustrations on the cross feature Daniel in the lions den, and the miracle of the loaves and fishes. Located amid the ruins of a Romanesque church, close by a 30 feet tall round tower on the original site of an early fifth century monastery, founded by St Patrick, the sculptures of Old Kilcullen in County Kildare comprise the remains of three high crosses. Biblical carvings feature the twelve apostles and some indistinct scenes from the Old Testament. An effigy of St Mac Tail, one of the first bishops of the monastery, is also visible. The two granite High Crosses at Graiguenamanagh, County Kilkenny, stand in the graveyard of Duiske Abbey, part of the Cistercian Order, founded in 1207. Both were re-errected on the site after being brought from Ballyogan in the Barrow valley and from Aghakiltawn. Their carvings include scenes from the Book of Genesis, the sacrifice of Isaac, and the Crucifixion of Christ. One cross also features a number of Celtic geometric designs. The three ninth century sandstone High Crosses at Kilkieran, County Kilkenny, form part of the Ossory group of crosses, which also includes the nearby sculptures at Killamery and Kilree, and the Ahenny High Cross in County Tipperary. Carvings are principally Celtic interlace designs and patternwork, but also include indistinct illustrations of animals, notably horses. The Celtic High Cross of Killamery in County Kilkenny, commonly known as the Snake-Dragon cross, is about 12 feet tall and stands in an old graveyard in Kilkenny. The site may have originally been that of a monastery, but no remains are visible. Carvings on the faces of the sculpture include: fret patterns, key patterns, a number of marigolds, snakes and an open mouthed dragon, Noah's Ark, details from the life of John the Baptist and the Crucifixion of Christ. The ninth century sandstone High Cross at Kilree in County Kilkenny, stands on the site of a medieval monastery - whose round tower still survives - about 9 feet tall, and boasts a range of geometrical patterns and bosses. It also includes a number of weather-beaten relief sculptures including: the Adoration of the Magi and Daniel in the Lions den. The weather-beaten Celtic Cross at Ullard, in County Kilkenny, is located behind a twelfth century Romanesque church. Barely discernible, the iconography of the sculpture includes: the Garden of Creation, the sacrifice of Isaac, Cain murdering Abel, six apostles (sculptures of the others may be lost), and the Crucifixion of Christ. Located on the original site of a monastery, founded by Lughaidh in the late fifth century, the High Cross at Dromiskin in County Louth stands in the church graveyard not far from the surviving round tower. In fact, only the head of the cross is original, the base being a modern granite construction built just before Irish Independence. Carvings on the original sculpture include: some figurative scenes, including David and Goliath, together with numerous dragon like creatures. The early Irish monastery at Monasterboice, County Louth, founded by Saint Buite in the late fifth/early sixth century, contains three sandstone High Crosses built in the ninth century, two of which are renowned as Celtic masterpieces of the medieval era. Standing not far from the well-preserved monastic round tower, they are known as The Cross of Muiredach, and the Tall Cross or West Cross. The Cross of Muiredach is about 17 feet tall, and its iconography includes Christ being mocked by Roman soldiers during the crucifixion, as well as Old Testament scenes depicting Adam and Eve in the garden of Creation and Cain being killed by his brother Abel. The Tall or West Cross is about 23 feet in height which makes it the tallest high cross in Ireland. Because of this, it has space for a considerable amount of biblical sculpture. Carvings on this High Cross include: Moses smiting the water, Samson bringing down the pillars of the temple, David and Goliath, Samuel anointing David, the Baptism of Christ, and Pilate washing his hands before the mob. The 9 feet tall Celtic High Cross at Termonfeckin, County Louth, stands in the graveyard of St Fechin's Church of Ireland, which itself stands on the site of a monastery founded by St Feichin during the seventh Century. Sculpture on the cross shows a picture of Christ in Glory while the rest of the cross is decorated with geometric patterns. Three of the Celtic High Crosses at Kells, in County Meath are located within the complex of the town's famous early Irish Monastery, which was founded in 804 by monks from St Colmcille's major monastery on Iona. The monastery lent its name to the Book of Kells, probably the greatest illuminated manuscript of the Middle Ages. As well as its cross sculpture, Kells monastery also has a beautiful round tower, standing some 82 feet in height. The ninth century Cross of St Patrick and St Columba stands around 11 feet tall and depicts several Old Testament sculptures including Adam and Eve, Cain slaying Abel and Daniel and the Lions. The tenth century West Cross, also called the Ruined Cross, contains more scenes from both the Old and New Testaments of the bible. These include: the Garden of Creation, the Return of the Israelites to the promised land, the Wedding feast of Cana, and the entry of Christ into Jerusalem. The East Cross is only partly finished. It contains the beginnings of a complex Celtic Key-design. The eleven foot tall Market Cross - considered the most outstanding High Cross in Kells - is located outside the town's Heritage Centre and features a range of biblical sculpture. This includes: Adam and Eve, Cain Slaying Abel, the sacrifice of Abraham's son Isaac, Daniel in the Lions Den, the Temptation of St Anthony, the parable of the loaves and fishes, and Christ in the tomb. In addition, the Market Cross has numerous Celtic figures, hunting scenes, battle scenes and indistinct animal and human figures. The 15 foot Celtic High Cross located on the Diamond in Clones, in County Monaghan, is actually a composite sculpture consisting of the head of one cross and the trunk of another. They come from what remains of a monastery in the town, founded by St Tighernach in the sixth century. The cross features numerous relief sculptures from the Old Testament, as well as the Adoration of the Magi, the Marriage Feast at Cana, Pilate washing his hands and a scene from the Crucifixion. In addition, the cross contains several Celtic interlaced decorative designs and bosses. There are two complete High Crosses which used to stand amid the remains of the early Irish monastery (noted for its illuminated manuscript the Book of Dun Cow), founded by St Ciaran in the sixth century, at Clonmacnois, County Offaly. Now, both have been moved and replicas substituted. The original Cross of the Scriptures, also known as King Flann's Cross, is now part of the town's Interpretive Centre. Heavily decorated with relief sculptures, the carvings include: the arrest of Christ, the crucifixion, and Roman soldiers at the tomb of Christ. The Cross of the Scriptures features Christ with Peter and Paul and the Last Judgement, plus numerous other indistinct carvings. The Cross of the Scriptures is referred to several times in the Annals of the Four Masters. West of the church at Durrow, County Offaly, on the site of the sixth century Irish monastery, founded by St Colomba and noted for its outstanding illuminated manuscript Book of Durrow (c.650), is the 12 foot Durrow High Cross. Carved on the head is a sculpture of Christ at the Last Judgement. Other iconography includes: Christ flanked by angels with St Peter and St Paul and other Old Testament scenes. The tenth century 8 foot Celtic High Stone Cross at Kinnitty, County Offaly, is located on the estate of Castle Bernard. The site was originally occupied by a monastery founded by St Finian in the sixth Century. Its sculpture includes: Adam and Eve, and a crucifixion scene along with some less distinct inscriptions concerning King Maelsechnaill the legendary King of Ireland (c.846-862). Standing in a graveyard near the Church of Ireland church where the poet WB Yeats is buried are the two High Crosses of Drumcliffe, County Sligo. They, along with the ruin of a round tower are the only remaining evidence of the original monastery, founded by St Colmcille here in the sixth Century. One cross features numerous relief sculptures of biblical scenes including: Adam and Eve, David and Goliath, and what appears to be the only sculpture of the Virgin and Child on a Celtic High Cross. The other cross is headless and plain. The two sandstone High Crosses at Ahenny in County Tipperary, from the site of the local monastery at Kilclispeen are among the earliest Celtic crosses. Celtic sculpture on each of the ten foot crosses includes geometrical celtic designs, as well as scriptural iconography showing David returning to Jerusalem with the dead Goliath. By the shore of Lough Neagh, at the graveyard of the sixth century monastery, founded by St Colman, stands the high stone cross of Ardboe in County Tyrone. Eighteen feet tall, the sandstone sculpture is the third tallest Celtic High Cross in Ireland and the highest in Northern Ireland. Its scriptural carvings include: Old Testament scenes as well as the Wedding Feast at Cana, the Adoration of the Three Kings, the Parable of the Loaves and Fishes, the Arrest of Jesus Christ and his crucifixion. Similar to the sculpture at Ardboe, the High Cross at Donaghmore, County Tyrone, is located at a crossroads close to the ancient site of the Donaghmore monastery, founded by St Patrick in the sixth century. The sandstone sculpture, which stands about 15 feet tall, is in fact a composite structure consisting of pieces from two separate crosses. 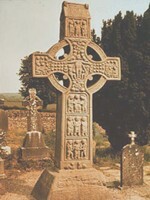 Its biblical iconography features several carvings reputedly associated with those engraved on the Celtic cross at Clones, in County Monaghan. The Donaghmore Cross includes sculptures of the biblical Annunciation to the Shepherds, the Arrival of the Magi, and the Baptism of Christ, as well as others relating to Christ's ultimate arrest and crucifixion. In content, one of the earliest High Crosses sculpted by the Celts in Ireland, the cross (built c.810) was originally discovered at Bealin in County Tyrone but later moved to its present whereabouts at Twyford Demesne, County Westmeath. About six feet in height, its sculptures depict hunting scenes, animals (lion, dog, deer, birds), as well as numerous celtic patterns of knot and interlace designs. Scholars believe the Bealin sculpture was originally contructed and carved at Clonmacnois monastery.  For information about Celtic sculptors of Ireland, see: Irish Art Guide.